The weather has been cloudless and clear for the last couple of nights. The temperatures have almost never been above freezing. Now I know some of you live in places colder than me, and I sympathize, but here at Fernley House, when the outside temperatures drop below -10°C, it becomes a losing battle to keep at least the living room comfortably warm. Even with the fireplace at full tilt, the temperatures start to fall. This morning, it being a holiday, I did not have to get up early, but eventually I had to get up because I couldn't stay warm in bed. 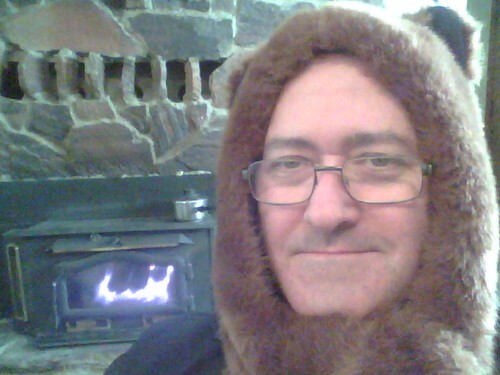 I put on multiple layers of clothing and stoked the fireplace up to its maximum heat output (above 1800°F you have to damp it back), and even then I was cold, particularly on my head. I had to resort to the heavy head artillery. The Bear Hat with trailing "sleeves" that can be used as mittens or wrapped around the neck as a scarf helped keep the cold at bay. travelswithkuma was worried that the hat was made out of an actual bear and that I would try to turn him into a hat. I reassured him that it's fake fur. This afternoon the temps briefly poked above freezing, and we hitched up the utility trailer and went to Big R and bought another pallet of Douglas Fir firewood. I've been burning it freely, and having another pallet is reassuring on these cold winter nights.